Sometimes you just have to sit back and admire the magical artistry of the performers on stage. 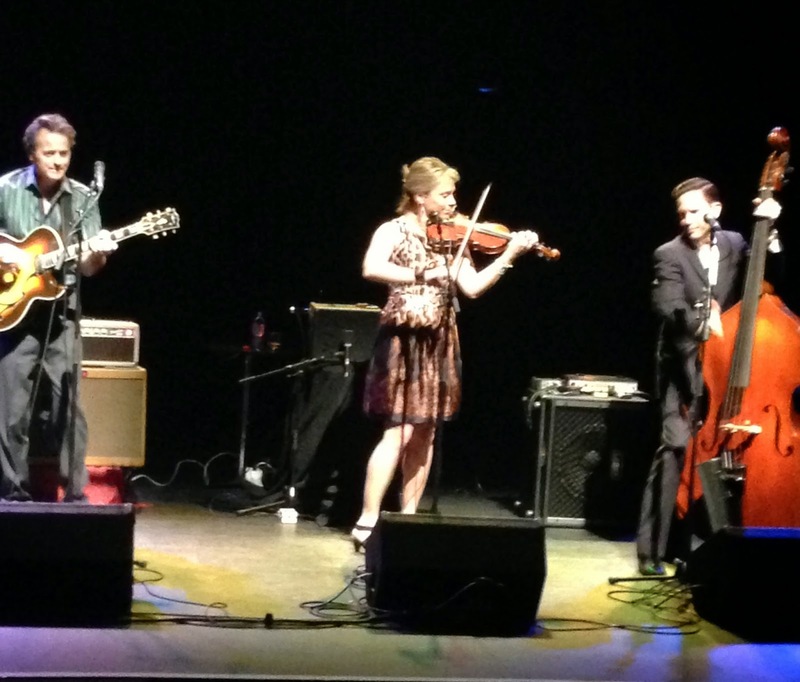 Whether in unison or exquisitely timed solos, the talents of the three members of Hot Club of Cowtown radiated from the stage at Bromsgrove’s Artrix Arts Theatre thrilling, exhilarating and beguiling an audience in awe of such ability to interpret a timeless sound. With two definitive styles to match their ideals and passion, the trio of Elana James, Whit Smith and Jake Erwin expertly worked the original and interpretative songbook of western swing and European gypsy jazz. While there may be occasional blurs in the styles, Hot Club of Cowtown float effortlessly between the dance halls of Austin and the smoky cafes of Paris. Without dismissing the concept of the sum of the whole being better than the parts, the lasting impression of a Hot Club gig is the incredible musicianship frequently displayed on a solo platform. Jake Erwin gave the most high-energised performance on upright bass seen for a long time, played with impeccable timing and tuneful rigour. 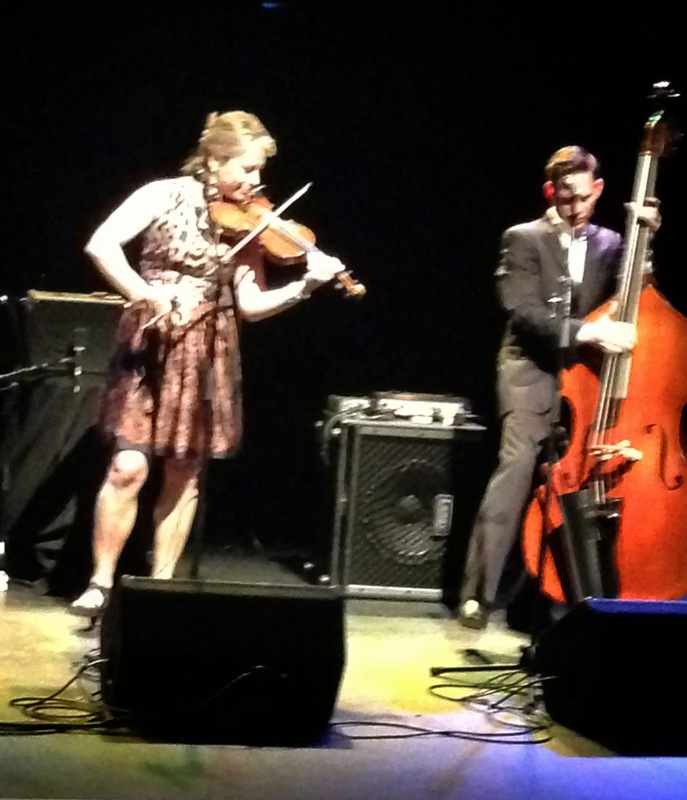 Elana James took the fiddle to places rarely seen in a non-virtuoso setting and peaked with an extraordinary pre-encore instrumental finale raising the stakes of the evening to crescendo proportions. Whether Whit Smith was playing his trademark 1928 Gibson L-5 or not, the sound from his guitar of choice oozed with classic twang and picking that probably tripled the old adage of ‘three chords’, whether in rhythm or solo. From a pair of sets just falling short of two hours in total, the chat was minimal and the songs flowed freely to form a set list exceeding thirty numbers spanning the continents. The first half probably had a more western theme to it with the three standout tracks being ‘Big Balls in Cowtown’, ‘Oklahoma Hills’ and ‘Deed I Do’, the latter being reminded of a previous Jools Holland performance. ‘Slow Boat to China’ gave the audience a hint of the European jazz sound the band explored on their most recent release RENDEZVOUS IN RHYTHM. After the break ‘Avalon’, ‘I’m in the Mood For Love’ ,‘The Continental’ and a French tune believed to be ‘Tchavolo Swing’ further reflected this slight change in approach. A number to probably stand alone more in the second half was a version of ‘Long Way Home’ by Tom Waits which saw the band at their most laid back, albeit for a brief moment. The vocals are slightly tilted towards Elana who co-founded the band with Whit in New York City back in the 1990’s. Whit also contributes solo vocal pieces such as on ‘My Window Faces South’ and is obviously an integral part of the three part harmonies when Jake breaks off from his frantic bass slapping to participate. All three brought the evening to an exciting close with a dual encore combination of the fantastic and poignant ‘Reunion’ followed by the ever fetching ‘Get Along Home Cindy’. There may be solo projects by Elana and Whit in motion but surely on the evidence of this evening’s performance the three piece band can continue to entertain and excite audiences around the world. Whether satisfying their own passion for the European jazz sound or flying the traditional flag for the core country music sub-genre of western swing, Hot Club of Cowtown remain important, influential and highly credible players on today’s music scene.